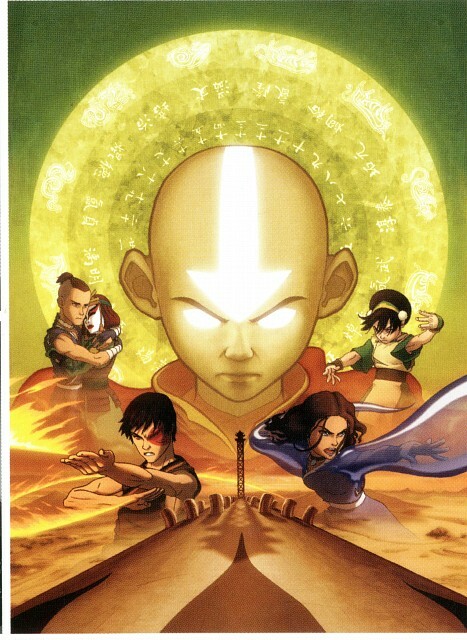 100 years ago the world existed as four nations: the Water Tribes, the Air Nomads, the Fire Nation, and the Earth Kingdom. In each nation are special individuals known as "benders" who are able to control the respective element (water, air, fire, earth) of their nation. Once a generation, an individual is born who can control all four elements. 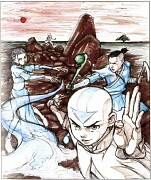 This individual is called the Avatar and is charged with maintaining balance between the four nations. However, when the leader of the Fire Nation, the Fire Lord, wages war on the entire world, the Avatar disappears allowing the Fire Nation to conquer most of the world. 100 years pass and now, in the present, a young water bender named Katara and her brother Sokka find a boy, an airbender named Aang, frozen in an iceberg and release him. Believing him to be the Avatar, Katara and Sokka begin their journey to help Aang master control of all four elements and restore balance to the world. This is an American anime rather than a Japanimation and you can see the different style in the art and dialog. The story is very fast-paced even though it continually focuses on character development. I've seen avatar 3 or 4 times when I was little. It was awsome!!! That they could lift up water or stone with out touching it. 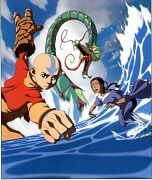 Now I don't know if it's so good anymore, but is still cool with Aang who can master control the four elements. omg! i could rewatch it and rewatch it!!!! the show was well spaced out and i loved every character! Absolutely love this series and definitely one of my favorites. Considering the demographic was aimed towards 6–10 yr olds, it's surprisingly mature and enjoyable for older folks, too. Great characters, well paced, and interesting plot. I highly recommend it. quite childish anime.. but even now i see it now and then when the moods permits. The story line is awesome however the character details and plot are not strong. it could be made much better. Though some don't count this as "real" anime, and it IS American made, this is surprisingly very very good. I personally spent my entire break of a week watching this all the way through (and it is by no means a short eries). There is a little bit of everything in this series that makes it so easy to be enjoyed by everyone. Although a lot think this series is for little kids and such, it honestly can be watched by anyone. I was 20 when I watched it for the first time and I still loved it. There are "hidden" elements that only a mature audience would pick up on, but safe enough for young kids to watch as well. There are loads of lessons to be learned seeing as the main character, Aang is only 12 and still learning all these lessons for himself. The action keeps the audience in there seats as this isn't just a running around and exploring but rather a dangerous adventure filled with fighting, defeat, conquest, romance, friendship, character developments, and fun. Like any long series there are "fillers" but the series DOES have a plot and a storyline that (espeically after the first season) needs to be followed in order to understand. Over all, I loved this series and think it's great for anyone that loves a little of everything.